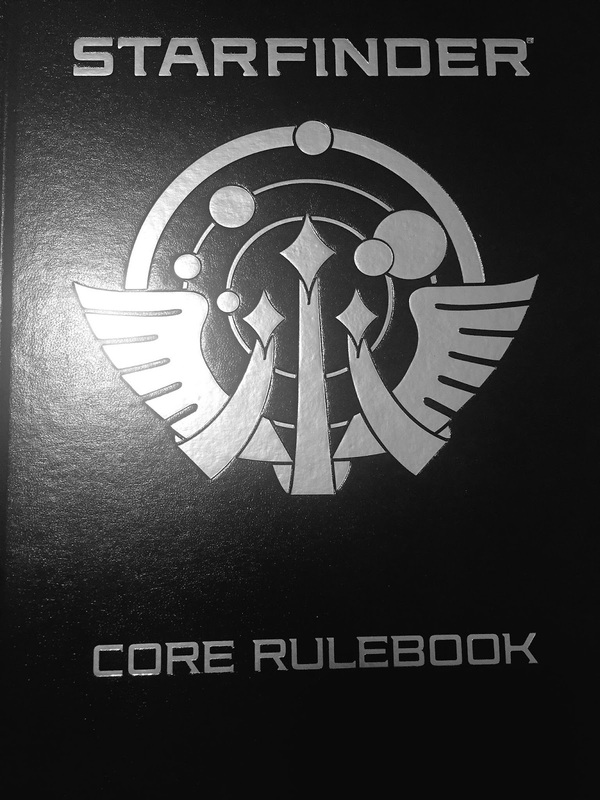 For anyone checking this out: I've moved to a new site for my Starfinder campaign and blogging activities. You can find my new blog at http://www.rpgcampaign.com/blog. 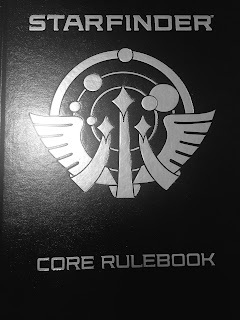 Got my copy of the new Starfinder Core Rulebook and... I am super excited to play! Trying to find a group of players in Seattle, surely that won't be too hard, right? I like the ideas and mechanics evolutions from the prior 3.5 branch. Most of the rules engine is similar; however, there are some great updates - simplified attack of opportunity rules, no more "blender mode" 8-attack rounds where 6 of the attacks have almost no chance of hitting, and a more universal approach to spontaneous spellcasting. My approach to the campaign setting will involve downplaying divine themes, making it more of a "Highway to Heaven" nod/grin approach than overt power. I also intend to downplay extraplanar themes. For instance, the "Abyss" in my campaign might be extragalactic space. Devils might be a specific grouping of aliens from a frightening, hellish solar system with an expansive military conquest. So on. Overall I'm looking forward to trying this out, and I might even report on it a bit here! Happy gaming everyone! Consistency & Complexity. Using different mechanics make everything harder to remember. Gain the Advantage is still too slow and cumbersome, and almost no one used it, even my NPCs. RAW is even worse; mathematically it's always better to fire instead. Faster speed doesn't matter enough. In order for risk/reward to matter in difficult terrain, there must be a definitive benefit to traveling at a higher speed. Otherwise the smart pilot just drops to speed 1 whenever possible. The following should all matter in space combat: Speed, Handling, Silhouette, and Pilot skill. These are in addition to regular combat properties, like Armor, Defense, etc. My new idea is to make Evasive Maneuvers and Stay on Target use Handling. Combat checks already include Silhouette, and I'll add a little dash of Speed in there to help cover that. Pilot skill is always the hangup, and my solution is to bring Gain the Advantage back to an action, and then juice it up a bit to make it more appealing. So, without further blabbery, here's version 2 of my house rules for Star Wars space combat in Edge of the Empire / Age of Rebellion. Within the context of ship-to-ship combat, I want to make the piloting skills more interesting and useful in Star Wars: Edge of the Empire (Age of Rebellion, Force and Destiny, et al); right now I view them as only useful in asteroid fields or such, and while that’s cool, I want to see them used more in combat. Abstraction is great for this game, but I want the pilot to have a skill-based effect on dogfighting. Additionally, I want to slightly alter how a ship’s Handling and Speed affected ship combat. Flying a more maneuverable ship should be advantageous. However, I do not want to over-complicate things, I want to keep combat resolution fast, and I want to keep the baseline design spirit for the game as much as possible. So, I have sought the smallest set of changes possible for these and other minor design goals, like getting rid of speed prerequisites. Here's the new rules for Gain the Advantage, Evasive Maneuvers, and Stay on Target. Before that, though, here's my new video star wars scroller for the next adventure, which I once again made with Adobe After Effects. Star Wars: Rogue from Mr. Blue on Vimeo.